The Giant Cheeseboard is a festival of cheese and mulled wine, taking place in North Greenwich on 16th, 17th & 23rd December 2017. Originally planned for just the 16th, its popularity has led to more sessions and dates - but still tickets are running low. 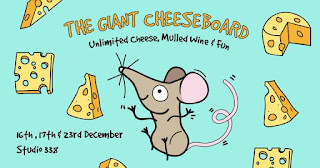 £30 gets you access to a giant cheeseboard (lots of varieties), plus unlimited mulled wine, cheesecake for dessert, and giant mice to serve you. Sounds brilliant! "Have you ever dreamed of being able to walk around a giant cheese board? Carving off slices of your favourite Emmantal, Red Leicester, Edam, Brie and every other cheese you can imagine? Surrounded by cheese, rolling around in cheese...eating so much ch...sorry, got carried away! This December we bring London it's first ever Giant Cheese Board - where you can take as much cheese & mulled wine as you like all day long. 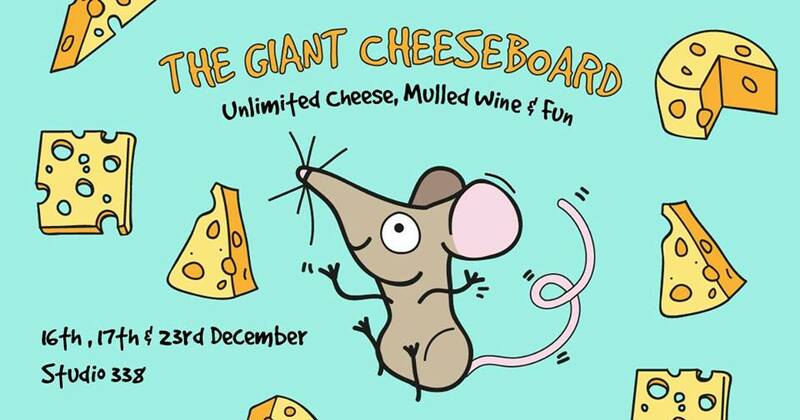 Yes, thats unlimited cheese and mulled wine on a giant cheeseboard...and a party too. Full production set which allows you to walk around and party on a giant cheeseboard! 3 areas of fun, music, cheese and wine to explore."